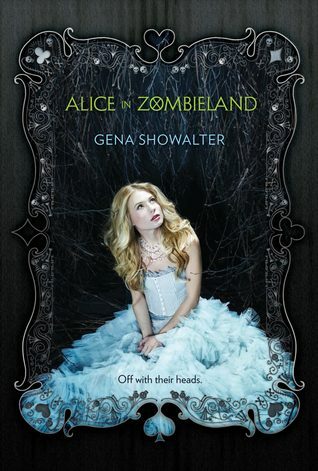 Alice in Zombieland by Gena Showalter follows Ali as she has been dropped into the world of zombies. Her father never let her or her sister out at night, was an alcoholic, and swore he could see zombies. Although she loved her father, she couldn’t help to sometimes wish he could be normal for once. She didn’t believe in the zombies that he could see. Then one day, Ali’s sister had a ballet recital she wanted to perform in and Ali begged her father to let them go. That was the day everything changed. Zombies attacked their car and Ali lost all of her family as their car crashed and the zombies ate her family. Ali thought she was going insane as she was taken in by her grandparents, but every once in a while she swore she saw something move outside her window at night. She finds others, who are known as the bad boys of the school because they are always bruised up and fail their classes, who can see the zombie and decide she must join them and take down these zombies once and for all. I am not a fan of zombie stories, they just never appealed to me, but this story was quite original and interesting. The zombies aren’t just the flesh eating zombies like you see everywhere, but actually spirits that are trapped on the earth that eat your spirit flesh. I find this to be a lot more spooky because that means most people can’t see them until they are attacked! All in all, this novel was very well written, original, with a cool Alice in Wonderland twist! Who can’t refuse an Alice in Wonderland theme in a story??? I give this novel a 4.8/5, just because some of the school girl fight scenes could have been a bit better and more real. It was a great novel and I recommend it to anyone who likes zombie novels, ghosts, or Alice in Wonderland.